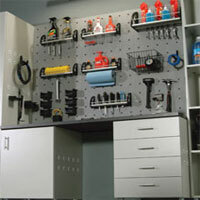 We are a family owned and operated custom closet and home organization company. We don't carry a big overhead burden like the franchise closet companies, so we can keep our prices low and pass the savings on to our customers. 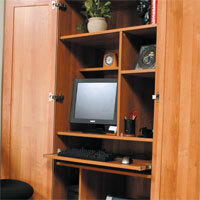 The president, Keith Ahee, has a wealth of experience in the custom closet, custom cabinet and millwork business. He has been a cabinet maker and carpenter since 1984 and in the general contracting business since 1989. Keith has an Associate’s Degree in Architectural Design and holds a Michigan Residential Builder’s License. All of our closet components are produced using the finest furniture grade 3/4" melamine board manufactured by Tafisa, the largest melamine and laminate manufacturer in the world. We offer matching 2mm edge banding in several solid and wood grain finishes. The hardware we use is superior, including concealed European hinges, full extension drawer slides, several finish options and numerous upgrades including valet rods, baskets, tie and belt valets, just to name a few. Every job is installed with the highest level of professionalism, meticulous attention to detail. We are dedicated to providing you with the best products, best service and best value in the industry. Your complete satisfaction is guaranteed. urea formaldehyde (NAUF). This ECO-friendly material is usually in stock and available in white in two weeks or less. Other colors and wood grain panels are special order and will require a longer lead time.